If you’re looking for a sofa that’s just as comfortable for binge watching your favorite show as it is for hosting overnight guests, a Day & Night sleeper sofa is the perfect solution. Here’s why. Supportive but still plush, our Day & Night sleeper sofas have nice high seats and tall backs. The proportions are comfortable for nearly anyone. Easy to sink into, easy to get out of and cozy to nap on. 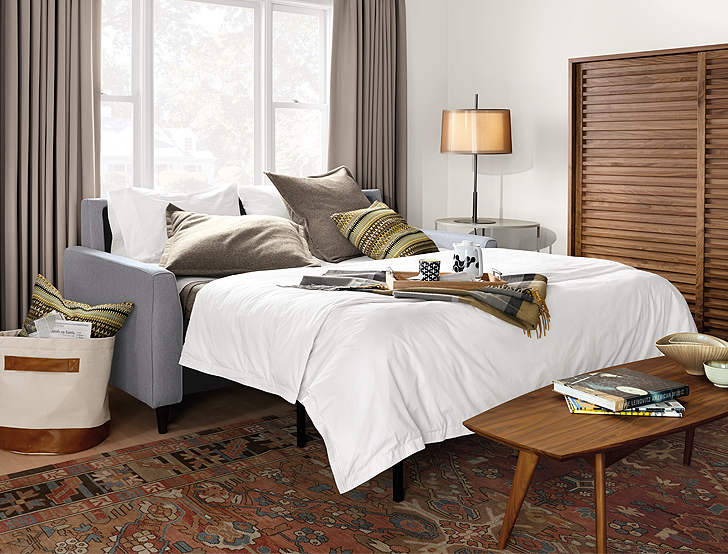 You won’t need to sacrifice your comfort to get sleeper sofa functionality. It’s a win-win. Berin has the most size options of any of our Day & Night sleeper sofas: mattresses from twin to king size, plus sectional options like the sofa and chaise shown above. We all have a memory of a horrible sleeper sofa, when all you felt were bars and springs the whole restless night. Day & Night sleeper sofas eliminate both of those nuisances. First, the dense foam mattress offers excellent support (without springs) and reduces any partner disturbance. Second, the mattress rests on a solid surface for even, bar-free comfort. The option to choose a Queen Plus or even a King mattress makes these sleepers perfect for your in-laws or other couples visiting from out of town. Our Day & Night sleeper sofas, like Trenton shown here, feature true mattress sizes for maximum sleeping space (most sleeper sofa mattresses are a few inches smaller than standard sizes). Our Day & Night sleeper sofas take up less space in your room because the back of the sofa becomes part of the sleep surface, so the bed doesn’t extend as far out into the room. It’s a breeze to set up, too—just lift from the padded handles and the mattress unfolds in one fluid motion. A simple one-person task. Check out our video to see how it works. Visit our stores to test out our Day & Night sleeper sofas for yourself, or dig into the details at customer reviews at roomandboard.com.